We have all heard the phrase, “following in someone’s footsteps”. It is used figuratively to mean that we look up to that someone who has set an excellent example. Hence following in their example is a means to avoid errors and harms, and to gain benefit and goodness. I have always wondered why “footsteps” were used as the metaphor, and not something else. I still do not know about that. But I often wonder about whose footsteps we could follow who has set excellent example. The simple and correct answer is the Final Messenger of Allah, Muhammad, upon whom be peace and blessings of Allah Ta’ala. They affirm the position of Ibrahim being the Imam, the leading model of Tawhīd‐ Oneness of Allah and that no partner is to be associated with Allah. This is the Station of Ibrahim, upon whom be peace. One of the rituals that symbolises all of this is the circumambulation of the Ka’bah. “Ţawafa”, from which is derived the word for circling around the Ka’aba, means to make effort to go in circle… if one has ever experienced centrifugal force of being forced away from the circle, and the effort needed to maintain balance in the locus of a circular motion, can really understand the meaning of this. There is another meaning to Ţawafa, which refers to spilling over, like good deeds would. The overflowing of the river banks utilises the same words, because with the overflow, the river leaves behind rich sediments full of minerals and nutrients for new planting. When actions are beneficial, they are exponential and greatly effecting of so many others, just live the overflowing river. Ţawāf is a Sign of this. The key concept attributed to the message related to Ibrahim, upon whom be peace, is Tawhīd; it is repeated oft‐enough times in the Qur’an in this context, in the verses relating to the Ka’bah. And Ibrahim, peace be upon him, was the perfect exemplar, model and Imam regarding Tawhīd. Which leads me to following in someone’s footsteps. The Station of Ibrahim contains a stone…. A stone etched with the deep effort of Ibrahim, peace be upon him. 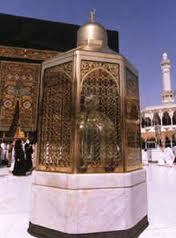 It is an imprint of the footsteps of the Prophet of Allah, Ibrahim, upon whom be peace. People who visit the Sacred House, would die to see it, or even touch it… and that is where the problem may arise. It may help to re‐read the verses quoted above and reflect on the many parts of advice and commands in them. There is a constant reminder of being purified, being focussed on Allah, that no partner be associated with Allah…. That the Station of Ibrahim is a manifest Sign. There is a constant reminder of being purified, being focussed on Allah, that no partner be associated with Allah…. That the Station of Ibrahim is a manifest Sign. That Sign is what is etched on the stone‐ the footsteps of the Messenger of Allah, Ibrahim, peace be upon him. The footsteps and indeed the stone is not meant to be marvelled over, but to be a reminder of the utmost striving of Ibrahim to returning everything to the Oneness of Allah. Upon the finishing of Ţawāf, it is recommended that one prays a two‐unit prayer in close proximity to the Station of Ibrahim. It is recommended that we recite Surah al‐Kafiroon and Surah al‐Ikhlas in the prayer. Both of these chapters compel us to remind ourselves firstly of how easy it is towards disbelief, and we seek no part in that; and secondly that we should we be sincere in embracing and submitting to the Oneness of Allah… that all we do and engage in requires our effort to turn to Allah alone. Upon arriving at the Station of Ibrahim, a pure heart looks to the site where Allah pointed the site for the Sacred House. He experiences the foundations of the House, and firmly realises the Oneness of Allah and associates no partner to Him. Him alone is the devotion towards. Not even the stone with the footsteps of Ibrahim so artistically presented, which can be a diversion for the purified heart. The visitor to the Sacred House does not get lost in the magnificence of the etched footsteps, the archaeological marvel, but is fully conscious of the Truly Magnificent that the footsteps is supposed to direct us towards. Being awed by the etched footsteps and its worldly magnificence is being awed by creation. It is supposed to be a Sign, not the possessor of the heart. The Station of Ibrahim is a Sign, for those who wish to reflect, and a Reminder, for those who wish to remember. It is a reminder of the footsteps Ibrahim took to be elevated to his Station of being the righteous, the true monotheist. Please type '133' into this field.